Graceful leaves and tendrils rise to the new day as symbols of courage, perseverance, and hope in the fight against breast cancer. This solid Sterling Silver ring by award-winning designer Marjorie Andes features a custom cut Pink Crystal cabochon and genuine Diamonds adorned with delicate scrolls and beading. 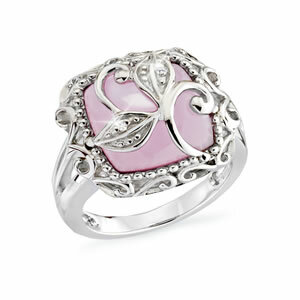 Wear this special ring to continue inspiring hope for those on their journey.